The era of a real :: virtual global series… CYFEST comes to NYC (Feb 2016) where CYLAND and Pratt Institute connect those engaged in the borderless, multidisciplinary, progressive movement redefining the intersection between Art :: Tech. Digital networks provide the traditional means of communicating within a new borderless set of parameters, creating a whole new structure of collective consciousness where dynamic, self-assembling tribes can unify instantaneously. Enabled by digital catalysts, society has gone from local to national and from national to transnational tribal behavior and congregation. THE UPCOMING CYBERFEST TAKES PLACE FALL 2015 — SPRING 2016 IN BOGOTA, ST PETERSBURG, BERLIN, LONDON AND NEW YORK. For the 9th annual edition, CYBERFEST is excited to expand its programming to Latin America, London, and New York. At Bogota's SOFA — Columbia’s most influential festival celebrating art, technology, and engineering — CYLAND Media Art Lab will present selections from The CYBERFEST Video Program, which will also travel to The Hermitage Museum (St Petersburg, Russia) and the Made In New York Media Center (Brooklyn, New York) as part of the 9th Annual CYBERFEST. St. Petersburg Russia will host CYBERFEST's beloved annual exhibition and Berlin, London, and New York will innaugurate CYBERFEST's pioneering public art programming featuring one Russian artist and one local artist in conversation at three carefully curated venues throughout each of the selected cities. For 2-4 weeks in Berlin, London and New York, CYBERFEST's first public art program will be presented free of charge at specially-selected venues to offer the public engaging and ongoing access to the very best in New Media. New York City will also host an expanded program featuring special exhibitions and events. Details coming soon. “PATTERNS OF THE MIND” explores the resurgence of the artist’s message across media and the complex new forms that have evolved to complicate the production and perception of art itself. In 1964, Marshall McLuhan coined the iconic phrase “the medium is the message” to reference the symbiotic relationship that develops between the form an idea takes and the way in which that idea is developed and perceived. Today, the rapid expansion of digital networks disrupts, dilutes, and confuses the once-concrete category of medium, leaving behind a slippery field in which message finds its own footing absent of any media-specific relationship. 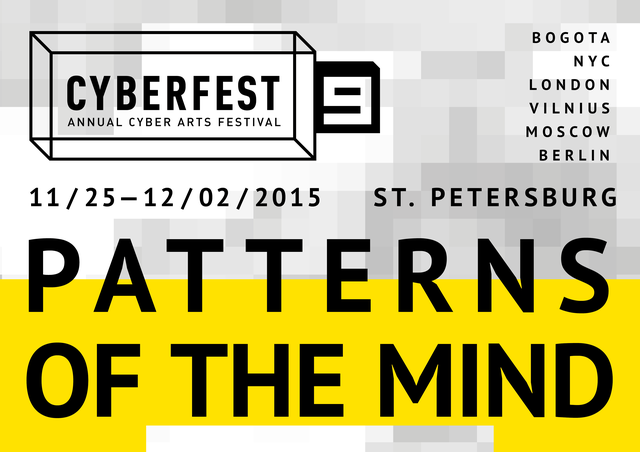 Founded by CYLAND Media Art Lab in 2007, CYBERFEST was held annually for six years across St Petersburg’s top art institutions (The State Hermitage Museum, Peter and Paul Fortress, Kuryokhin Modern Art Centre, Creative Space TKACHI, Borey Gallery, Gallery of Experimental Sound and Art re. FLEX gallery), earning a reputation as the original and the most significant New Media event in Russia. Making a pivotal leap in 2013 — CYBERFEST’s 7th edition expanded for the first time outside Russia to Berlin, attracting over 10,000 visitors over 5 days. In 2014/2015, CYLAND & CYBERFEST reached further by branching to 5 innovative cities (St Petersburg, Moscow, Tokyo, Berlin, New York) on the Art & Tech frontier, strengthening cultural exchange among innovators.